Covering the popular highpoints of the Dark Peak. Printed on polyethylene - durable, tear-resistant and 100% waterproof. Made in cooperation with the British Mountaineering Council, colour shading for easy identification of hills and valleys. 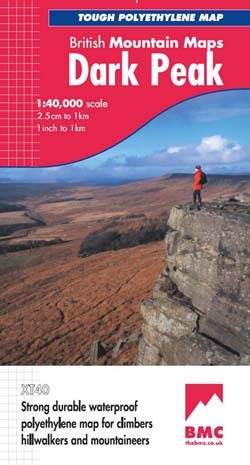 Less than half the weight of a laminated map, detailed 1:20,000 enlargements of the Kinder plateau. Geological map the Dark Peak supplied by the British Geological Survey. Mountain incident and first aid advice, tips on using your map and compass. Useful local phone numbers and websites.